Valeriana are hardy perennials that reach from 15 to 90 cm (6 to 36 inches) in height. 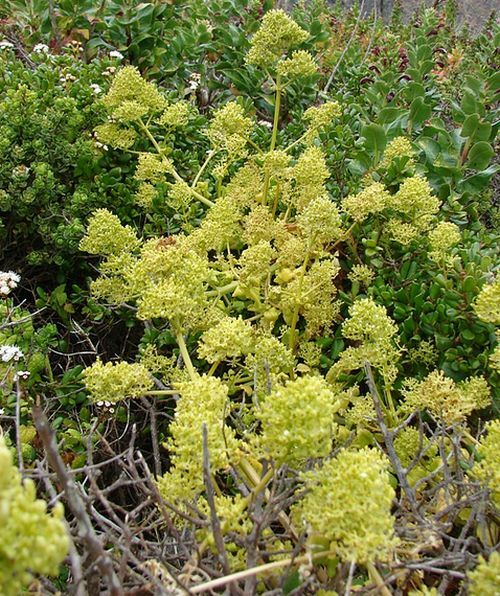 They bloom in the summer and carry clustered heads of tiny white or pink flowers on branches. Some of the common varieties of Valeriana grown in the garden include Valerian and Garden Heliotrope. Check out my guide on how to grow Valeriana officinalis. Valeriana obtusifolia by Pato Novoa. Valeriana officinalis by Pamla J. Eisenberg. Common Names: Garden heliotrope, All-heal, Valerian: Garden; Alpine; Mountain; Spikenard; Californian; Marsh. Scientific Name: Valeriana dioica; V. hardwickii; Valeriana officinalis; V. pyrenaica. Height: 6 to 60 inches (15—150 cm). Native: Europe, Americas, and western Asia. Flower Details: White, pink. Tiny. Salverform. Strongly fragrant. Massed in heads. Showy. Foliage: Clumped. Scented. Basal foliage is deeply lobed. Stem foliage is sparse, odd-pinnate, toothed, and lance-like. Sow Outside: Cover seed. Start of spring - before the last frost. Sow Inside: Germination time: three to four weeks. Temperature: 70°F (21°C). About eleven weeks before expected last frost. Transplant outdoors following the last frost. Space at 6 to 24 inches (15—60 cm). Requirements and care: Full sunlight or partial shade. Mist soil. Slightly acidic to neutral ph 5.5 to 7 for best results. Provide support. Deadhead to prevent seed-set. Cut back stems to the ground in autumn. Divide after four years to maintain vigor. Propagate: by dividing in the spring in cooler areas or the autumn in warmer areas. Self-seeds freely. Miscellaneous: The roots of the Garden Valerian (Valeriana officinalis) is used in traditional medicine as a sedative, and in the treatment of anxiety. Can be invasive in some areas as it spreads from rhizomes; consider growing in a contained area. 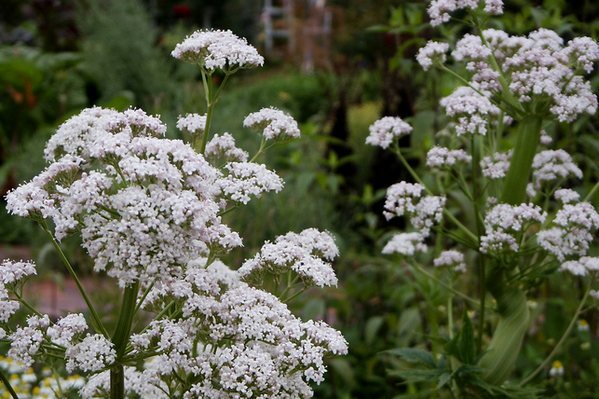 If you plant to grow Valerian from seeds outdoors, then sow at the start of spring, and lightly cover the seeds. The spacing that you sow at depends on the species of Valeriana, sow small ones from 15 to 30 cm (6 to 12 inches) apart, and larger species from 45 cm to 60 cm (18 to 24 inches) apart. Ideally Valerian should grow in a sunny or partially shaded part of the garden that has a moist rich soil; pH should be from 5.5 to 7.0. If first growing indoors then start about three months in advance. The germination time of Valeriana is about three weeks when done at a germination temperature of 20 to 23 degrees centigrade (68-73°F). Transplant the young Valeriana seedlings into the garden following the last frost. It is pretty easy to look after Valeriana plants such as Valerian and Garden heliotrope. They like a moist soil so keep them well watered; stake larger Valeriana species; dead head flowers before seed set; divide every three years to maintain vigour. 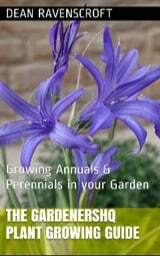 If you want to propagate Valerian then divide in spring or autumn.